I set up another identical system and will transfer them and the sponge filters over tomorrow. Doing this to avoid any buildup of bad things in the current tank. Great work.. We need more qualified people with your dedication to succeed. 15 years in the hobby yet still learning every day. 280g radium lit sps flat living in my garage rent free. Current Tank Info: 105g SPS dominant euro braced powered by 4 ecotech pumps and lit by an ATI powermodule controlled by a reef angel =). Wow, that is amazing! I wish that I had starfish for you. 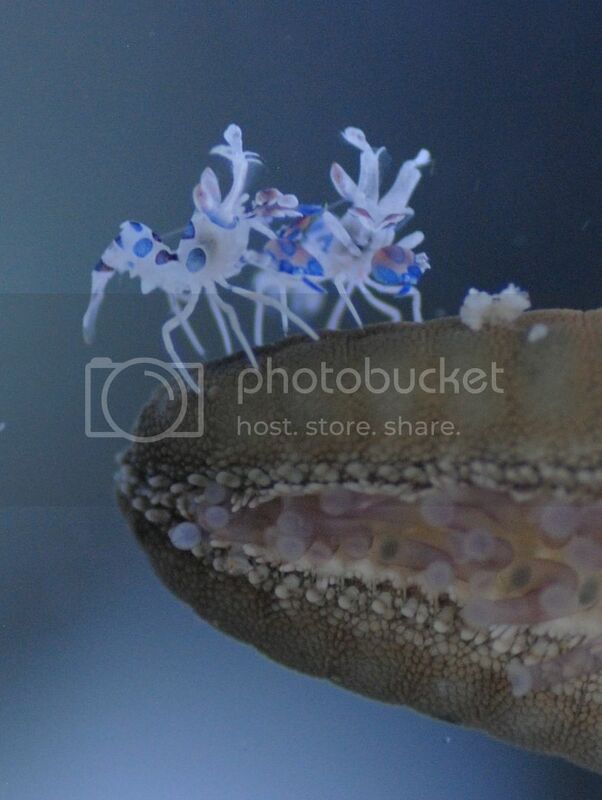 These gorgeous little shrimp are the reason that I decided too start keeping a saltwater aquarium. I love how they look but I've been doing tons of research and they seem like they might be too much for me at first. I noticed you said you were going through half a million copepods a day? How big a system and how much time do you have too dedicate too suppy that many? Thanks from a noob. They are so beautiful....great job guys!! Do you know when these will be for sale? I can also bring some starfish up when i stop out. We are not really pushing them, but we can sell them in our store now. The world's first commercially available captive reared harlequin starfish. We are not shipping them at this time. They are eating chocolate chip starfish and asterina starfish whenever we get any. We have a huge amount of money invested in this project and will probably never recoup our investment, but it was worth it for what we learned about culturing that we can apply to other species. We are working on training them to eat an alternative food. Fantastic! I prefer captive breed critters whenever possible (and I'm willing to pay)! we still have 100 plus left. What is standard lifespan of harlequin? You cant know for sure unless you raised them from settling.